Kelbly makes outstanding actions, including the Stolle Pandas. In the past 20 years, Pandas have probably won more benchrest matches than any other action (though BATs and Bordens are increasingly in the winning circle). Recently gunsmith Alex Wheeler of Wheeler Accuracy worked his magic on an aluminum Panda, optimizing the “ignition timing” of the action. This involves many small mods to bolt, camming surfaces, trigger, and firing pin: “The whole cam helix and detent shelf is re-cut. The firing pin and cocking piece are modified as well.” When executed properly, Ignition Timing has a number of benefits, including a smoother bolt opening/closing, improved firing pin fall, and enhanced accuracy (though the accuracy improvements can be subtle). 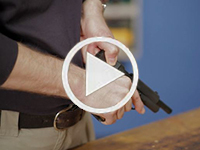 Share the post "Panda Perfected — Ignition Timing for Kelbly Panda Action"
While AccurateShooter.com focuses on rifles, we know that a large percentage of our readers own handguns, with 1911-style pistols being particular favorites. 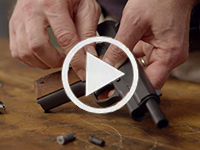 For you 1911 owners, here are six short videos from Brownells showing how to customize a 1911-style pistol with after-market upgrades. 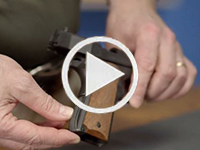 This six-part series by Brownells provides step-by-step instruction on how to accessorize your 1911. The videos cover changing out the mainspring housing, magazine release, slide release, hammer, guide rod, and installing a group gripper. 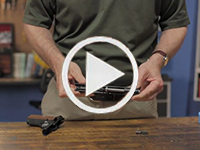 Share the post "Brownells Videos Show How to Accessorize 1911-Type Pistols"
There’s a new two-stage trigger for Remington and Rem-clone actions from CADEX Defense of Canada. The new CADEX DX2 double-stage trigger adjusts from 1.5 to 5.0 lbs pull weight. Both stages can be adjusted separately through allen-head screws located on the front of the trigger body. The trigger shoe also adjusts fore and aft. The CADEX DX2 is offered in both a standard version (no safety or bolt release) and a version with integral safety and bolt release. The cost of the standard DX2 is 267.95 Canadian dollars, or $202.62 U.S. Dollars at current exchange rates. Add forty dollars (Canadian) for the version with safety and bolt release. “My CADEX two-stage trigger arrived[.] I installed it into my Badger M2008 action/rifle in 6 Creedmoor. Initial impression is that it’s very nice. You can adjust each stage for pull of weight. You can adjust the position of the trigger shoe and [adjust] for over-travel as well. I think the pricing on the trigger is going to be very competitive and it will be a nice option out there for another two-stage trigger. Frank Green said there may be some clearance issues with some trigger guards: “The CADEX trigger shoe assembly is a tad longer than a stock Remington. In my trigger guard it barely bottomed out/touched in the guard but functioned just fine but to give it a little room I milled .010″ off the bottom of the shoe. My trigger guard is a Defiance. I’d have to throw the trigger onto a Remington rifle/trigger guard assembly and a Badger bottom metal to see if it does the same thing but [this] is minor in my opinion. Share the post "New CADEX Two-Stage Trigger from Canada"
We often hear requests from Tikka T-3 owners asking how they can reduce their trigger pull weight. Paull offers a Tikka T-3 varmint trigger spring which can reduce the pull weight significantly. The photo at left shows the Tikka T-3 trigger assembly. 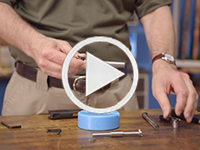 Share the post "Ernie-the-Gunsmith Offers Wide Selection of Trigger Springs"
Share the post "Pre-Season Maintenance On Your Rifles"